From the useless trivia department comes this oddity . . . just three U.S. ski areas spread themselves across two state boundaries. While you try to figure out which are the two-state resorts, allow me to boast that until proven otherwise, I am the only human on earth who has skied all three in one season. Heavenly Mountain Resort is the biggest and best known of the three. Located in the South Lake Tahoe region, Heavenly calls both California and Nevada home. While there are signs on the trails noting the state borders, the real difference is at the base area where gambling is allowed in Nevada, but not in California. While the casinos are a great side bet for those who want more to their vacation than snow fun, the skiing is enough of a reason for a winter visit. While I can’t speak for all East Coasters, for many of us the idea of big time western skiing stops on the west side of the Rocky Mountains. And it’s hard to think about serious skiing in a place that has “lake” in its name. But Heavenly is the real deal with 4,630 skiable acres, 3,500 vertical feet, 97 trails, 28 chairlifts (including nine high-speed lifts) and plunging 1,600-foot chutes. Heavenly is an Epic Pass resort as are Northstar and Kirkwood, which claim the California side of Lake Tahoe as their home. Heavenly opens for the season on November 16, weather permitting. While the Red Sox and Yankees have a long-standing baseball rivalry, the snow is a uniter at Catamount Ski Area located in Hillsdale, New York and South Egremont, Massachusetts. Catamount has 36 trails, a 1,000 foot vertical drop and 7 lifts, though none are high-speed detachables. Night skiing is available on 15 of those trails. My skiing at Catamount last season is not the area’s biggest news. Last May the resort was sold to the owners of nearby Berkshire East Mountain Resort . . . in Massachusetts. The change in ownership should mean renovations and upgrades both on the mountain and at the base lodge for the 80-year-old resort which was showing its age. The new owners are also working on the dream of the previous owners to make Catamount a true four-season resort. Catamount is neither an Epic nor Ikon mountain but they offer a deal that’s hard to refuse. Buy daily lift tickets online for just $20 per ticket to ski or snowboard Monday –Thursday, non-holiday. These tickets are not date-specific. New York State has 43 alpine ski areas, the most in the country and they claim Catamount as one of their own — they don’t say 42.5 ski areas . . . so take that Red Sox fans. Lookout Pass Ski and Recreation Area is located in both Idaho and Montana, just off Interstate 90’s Exit 0 in Montana. Exit 0. How cool is that? Not only is Lookout Pass a two state ski area, it is a two-time zone resort, which can mean confusion. Cell phone clocks change as skiers and riders traverse between Mountain and Pacific times. Folks who sign up for two-hour lessons sometimes protest that they only got an hour’s worth of instruction when they glance at their cell phones. The resort officially operates on Pacific Standard Time. Lookout Pass is in the Northern Rocky Mountains with most slopes facing north or northeast. That means an average of over 33 feet of annual light dry snowfall that stays put. The resort has a 1,150 foot vertical drop with 540 acres of skiing on 35 named runs and powder glades. They will soon be expanding to Eagle Peak which will double the acres and increase the vertical to 1,650 feet. Presently snowsliders access the fun on 3 double chairs and 1 triple chair. Speaking of fun, I was there during Ski Lookout’s annual wife carrying contest. This season the event is scheduled for Sunday, January 13. Wife carrying at Lookout Pass is the ultimate catch-22 situation because the cash prize is based on the weight of the wife. The heavier the wife, the bigger the prize. But a heavier wife is harder to carry. Some will find wife carrying and its rules to be either politically or socially incorrect, but it sure is a hoot to watch. Wife Carrying Competition at Lookout Pass on the Idaho Montana border January 14, 2018. Lookout Pass has a 20 year expansion plan which includes an additional 2,000 acres of lift-served terrain. A good option for lodging is Wallace, Idaho, a quirky old mining town on the South Fork of the Coeur d’Alene River. Lookout Pass is closed Tuesdays and Wednesday except during holiday weeks. Lift ticket rates vary for age and type of day, but all full day tickets are under $50. These three resorts make the oddity of skiing in two states on one pass in one day easy, but not so much so for management. Two states means two bureaucracies with two sets of safety inspectors for the lifts and the restaurants. And sales tax payments to two states. And two telephone area codes. Glad I was on the customer side of the two state resort oddity. Martin Griff is an East Coast ski bum. 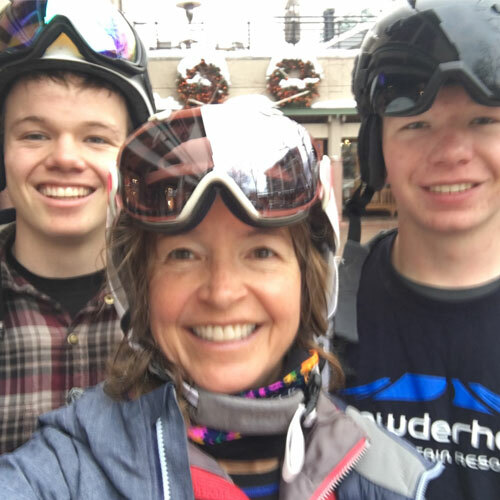 A journalist by education and profession, he shares his thoughts, impressions, experiences and those things that puzzle him with Braveskimom.com throughout the ski season. © 2018 – 2019, braveskimom. All rights reserved. Any use or publication of content, including photos, requires express permission. You are missing out on Wilmot “Mountain” now owned by Vail resorts. It straddles Illinois and Wisconsin. Not nearly the vertical feet of your other locations, but being in the midwest having the ability to ski across state lines is about the only stat we can get excited about! Kate, thank you so very much for pointing out Wilmot Mountain! Martin, you had better put this one on your list! I wish I had known about Wilmot Mountain last season. I stopped in Chicago to visit a friend while on my way home to New Jersey from the Rockies and I could have made Wilmot a stop. I checked Wilmot out on Google maps and at the top of chairlift 1 there is about 1,485 square feet (about the size of the inside of a small house) of skiing in Illinois on the aptly named State Line Trail. Oh no! Not meaningless! You’ll just have to do it again! Thanks for a fun post, Martin! Another stateline straddling ski resort has come to our attention thanks to sharp-eyed and knowledgable Ollie Wilder — Lost Trail Powder Mountain Montana and Idaho!